Sunday April 7th from 12:00-3:00 p.m.
You say you like pasta? 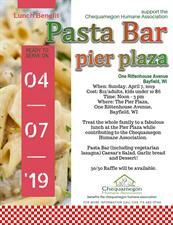 Then come join us at the Pier Plaza for CHA's luch benefit. Enjoy the Pasta Bar (including vegetable lasagna), Caesar's salad, garlic bread and dessert while you help support homeless animals. We will have 50/50 raffle. ?